Not compatible with current games.You will have to restart a new game. May be played with 1.02b version of RUS, and the 1.03, this one being currently bugged ( hotfix is bugged too). - modded NM values in relation with objectives, as Red was too much affected by losses of strategic regions, most of them being in the periphery of the Sovpedia. Red NM should average a slighty higher level. - the Moscow revolt at start will now belongs to the new Left SR faction ( AIs updated to cope with too). Contrary to the official game, Fatal Years has developed a system built on random and player chosen variations of the Allied Intervention Level. In the official game, Allied units, and subsidies to White will begin and end at fixed dates. In Fatal Years, their end will be determined by the Ail, whose evolution is determined by random events and options. An Allied Intervention Level has been implemented, stepped up of 0 to 13. Starting level is 8. A level 8 or superior is mandatory to get the help of the French, British, Greek and American troops, a level 3 or superior to get from Western Powers money and resources. 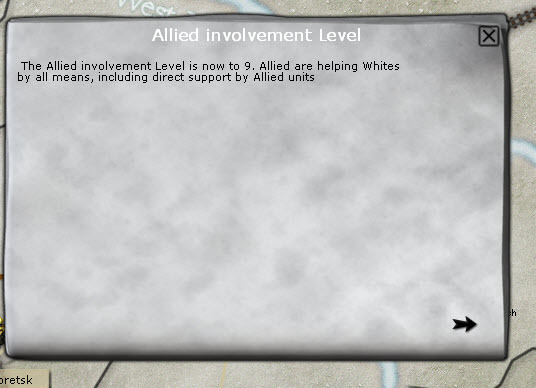 The Allied Intervention Level will vary according to random events, that represent the consequences of the hesitations Allied Nations suffered, wavering between to fight Communism and to put an end to the war. Every player can also buy by option ( named Concessions to Allied) an influence on the level. Red attack on Poland will raise this level too. When one of the two White Factions reaches at least 120 NM, there’s a chance the AIL will be raised by one ( 120can’t only be reached by large victories and such a Faction would then be seen as possible future rulers of Russia, easing bidding on them). If Reds reaches 120 NM, the AIL may be lowered randomly by one (historically, Western Allied switched to a containment policy when it was assured Bolshevik regime was winning the war). If Reds chooses to implement “Land reform” option, the AIL could lower ( by this option, the Red side is implementing the NEP policy, which appeared in Western Nations like a partial abandon of the communist utopia and so like a first step toward the renunciation to the World revolution). By the contrary, adoption by the Whites of the Land reform could raise the AIL ( Land reform being considered as an evolution toward a democratic Russia, positively seen by public Western opinion). Last, when Reds will play the option “Provoke strikes in Western Nations”, the Ail will be raised by one. French and Greek troops in Ukraine will start fixed at Odessa and Sevastopol, but may be unlocked if the Allied Intervention Level raises 13. Under 6, these units will be removed from play. Under 3, other Allied units will be removed from play, to the exception of some locked units (like Japanese divisions).The financial help will be stopped too. Notes: an Allied Intervention Level of 13 represents Allied Nations deciding to “stamp out the virus”, releasing any restriction of armed development, especially for France in Ukraine. Random variations are simulating how much Whites and Red had only very partial influence on diplomatic postures of France and Great Britain, this influence being somewhat represented by the (costly) options players get during the game. Thanks a lot for your awesome mod ! I'm spending far too much time with this game, but I'm loving it. If the AI allows it, of course. - controlling Samara after January 19 (2 NM). The Southern White faction becomes controlled by you. You will be able to move the WHI units, get part of WHI options…..
Notes: Siberian Side has now a real interest to be played, and in PBEM with 3 players, this rule has for primary effect to create frictions beween the 2 White players, unless Southern is willing to leave the game of course. In single player game or 2 players PBEM, Siberian player has now a big objective to fulfill with mediocre military means, which is both interesting and unusual in computer wargames. A VERY HUGE STEP forward[/size]. ANd for me, one of my best idea since I created the curent AACW Kentucky events which have been later copied in the official release. When I add a feature in FY, my very first concern is to determine if AI may cope with. That explains why in FY some games against AI end in the last trun by a stalemate . On this one, the RED AI since long takes care of Tzaritsyn. This event BTW dooesn't affect Siberian AI, as Sib. AI controlling Southern AI would lower the White AI performance. 3) Exception caught: 1001015 1st Red Army Violation d’accès à l’adresse 007EEAA8 dans le module ‘RUS.exe’. New version on my blog fixing the bugs. Sorry for the trouble. Looks great! Though I thought August was the month of SVF? von Sachsen wrote: Looks great! Though I thought August was the month of SVF? It's coming Any work on FY is beneficial for SVF ( and DNO BTW), the scripting tools being the same, to a few minor exceptions. Then the RCW offers so much variety in situations, alliances, AI stuff AACW appears so much simpler. I should add the general design of AACW is sounder than the shortcoming of the official version, especially since the 1.01. AACW needs much less work and a part of it has been done in SVF 1.1. Last, I've been fantatiscally helped in the last weeks by dedicated players who have tested extensively FY, allowing me to remove much of the bugs. 2 days ago, I was sure to have created a version of FY which would remain stable some weeks, and suddenly, I've discovered the AbsorbFaction command was working in RUS.exe, solving my troubles with Siberian side shortcoming. When such an idea comes, you have to create the files at once In this case, I've been forced to duplicate/modify more than 100 events and leaders.........But NOW I'm sure FY version will be stable for the next weeks ( except bug fixes, but they seem only minor remain), so I'm getting more time to devote for SVF 2.0. Try FY . The RCW has IMHO the same interest than AACW. The last game played by a player as Southern Whites ended at the very last turn of the Grand Campaign ( January 1922) , result being a stalemate....The RED AI could interest you for long. I'm not in dire need for new players. FY is more and more downloaded since I left this forum and the comments are generally highly positive. I've got the required number of players to fix and improve FY, my aim remaining to have a RCW game as best as possible for my own playing pleasure. Howewer, it could give you an idea of SVF2.0. Oh, don't worry I've been playing FY and enjoying it. The RED AI is scary! It is just that AACW has a special place in my heart for whatever reason and knowing that such improvements are just around the corner is both exciting and makes that much harder to enjoy the game as it is now. von Sachsen wrote: Oh, don't worry I've been playing FY and enjoying it. The RED AI is scary! It is just that AACW has a special place in my heart for whatever reason and knowing that such improvements are just around the corner is both exciting and makes that much harder to enjoy the game as it is now. Don't worry then . AACW has too a great place in my own thinking. The new official patch 1.03a has been released today. 2) Install again Fatal Years mod, as the official patch will remove some files of FY. A few days ago a FY player has ended his game as Southern Whites against Red AI in the very last turn , ie January 22, by a stalemate. Not a minor victory, but a stalemate against AI. It wasn't its first game in FY, and he has played AGEOD games before. Like Clovis, Athens is deactavating his login by himself. see you later on other boards. Here's the turn before the Finland bug. I had to play the turn a few times to get it to fire again, but it seems to be repeatable. The scriptreport I added in was for the turn after I got it to fire again. BTW, this is my 2nd game. I was barely holding my own in my last game, but they beat up on the Sibs I guess because their NM made it up to 167 before I threw in the towel. Does anyone have the latest FY version? Clovis disappeared into the night again and his website is no longer online. I would like to take a look at the work he has done so any help would be greatly appreciated! If you use NoScript, you can block the popup obstructing access to the site. Anyway, if you go here (box.net/static/flash/box_explorer.swf?widgetHash=vzghyg7v70&cl=0) (sorry for the lack of a clickable link, I'm not yet allowed to post links), it should take you directly to the widget from where you can download the latest version and the manual. If you have any problems, I can just upload the files somewhere more convenient. Owl wrote: If you use NoScript, you can block the popup obstructing access to the site. Anyway, if you go here (box.net/static/flash/box_explorer.swf?widgetHash=vzghyg7v70&cl=0) (sorry for the lack of a clickable link, I'm not yet allowed to post links), it should take you directly to the widget from where you can download the latest version and the manual. If you have any problems, I can just upload the files somewhere more convenient. You're welcome ! Be advised though that there appears to be a small scripting error that crashes the game in early 1919, as experienced by both a friend of mine as well as myself. I think I've managed to fix it though, so if you're interested, I could upload the one file I changed once I'm back on my computer. I've been playing FY on PBEM and it's been fun. So much that I've gone ahead and fixed up some files. There were some translation issues and clarifications I made so it's easier to understand. Links to find mod, and how to install it, appear broken. Can someone post them?